GLOUCESTER — Better living through chemistry? From their clinical trial (in more than one sense), British playwright Lucy Prebble (“Enron’’) has fashioned a bracingly smart drama that offers a psychopharmacological twist on a universal human dilemma: Can any of us ever completely trust what we are feeling? Along the way, “The Effect’’ also forces us to confront the question of what, finally, we owe to one another when the chips are down. It’s worth mentioning that the playwright’s explorations of these questions are wrapped within a pretty suspenseful scenario, and further worth noting that under the probing direction of Sam Weisman, the New England premiere of “The Effect’’ at Gloucester Stage Company captures the multiple dimensions of Prebble’s play. Though there were a couple of timing-related hiccups at Sunday’s performance, the production is consistently engrossing. 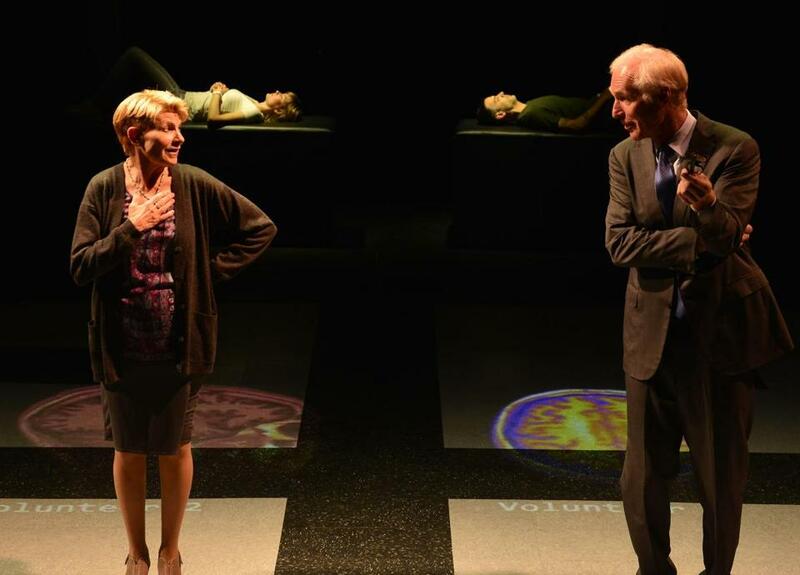 In a sense, “The Effect’’ is the kind of cerebral scientific drama you associate with the resident companies at Cambridge’s Central Square Theater. But it also fits snugly within the tradition of small-ensemble character dramas that have long been a hallmark of Gloucester Stage. Weisman clearly understands that “The Effect’’ is more interested in cause than effect. So he has constructed his production as an inquiry into the labyrinthine workings of the human brain, a thrashing-out of dueling emotional imperatives, and a study of what it takes to be happy — a word that recurs again and again in Prebble’s script. Their shared status as pawns in a larger game is suggested by J. Michael Griggs’s black-and-white, chessboard-like set. Another crucial atmospheric thread running through the production is the coolly hypnotic original music composed by Claudio Ragazzi, which has been skillfully integrated by sound designer David Remedios. Played by Susannah Hoffman, Connie is skittish and generally seems to have her guard up, while Tristan (Mickey Solis) comes across as a goofily carefree extrovert. These opposites begin to be attracted to each other after they start taking a new antidepressant — or is that really when it starts? — under the watchful eye of Dr. Lorna James (Crouse), who is herself answering to Dr. Toby Sealey (Hall). No sooner have Connie and Tristan launched on a romantic relationship than Connie, especially, starts to wonder whether their love is real or drug-induced. Hoffman and Solis make us care about the answer. Hoffman delivers a deeply felt and sharply individualized performance as Connie, a character who is capable of surprising you. Solis, for his part, finds the turbulent layers beneath Tristan’s jovial-bro surface. It’s been a long time since Hall did theater, but you wouldn’t know it from the vivid figure he cuts on the stage. His Toby is self-aware but hard to read: an intriguing combination. Then again, multiplicity seems to come naturally to Hall; on Sunday night, hours after I saw him perform in “The Effect,’’ I watched an episode of HBO’s “Veep’’ (which stars his wife, the glorious Julia Louis-Dreyfus) that turned out to have been directed by him. And Crouse? Over the past decade, she and Gloucester Stage have developed a mutually beneficial relationship. It’s not often that a theater this small can count on regularly showcasing a performer of her stature, but the arrangement has presented Crouse with the kind of professional challenges any actress worth her salt would savor. To that list can now be added her searching portrayal of the troubled Lorna in “The Effect.’’ Bit by bit, Crouse reveals the pain pushing up and through Lorna’s professional detachment until we know for a haunting certainty just how much this drug experiment has cost the psychiatrist. Crouse’s broken delivery of the line “I don’t have enough skin’’ will stay with me for a very long time.